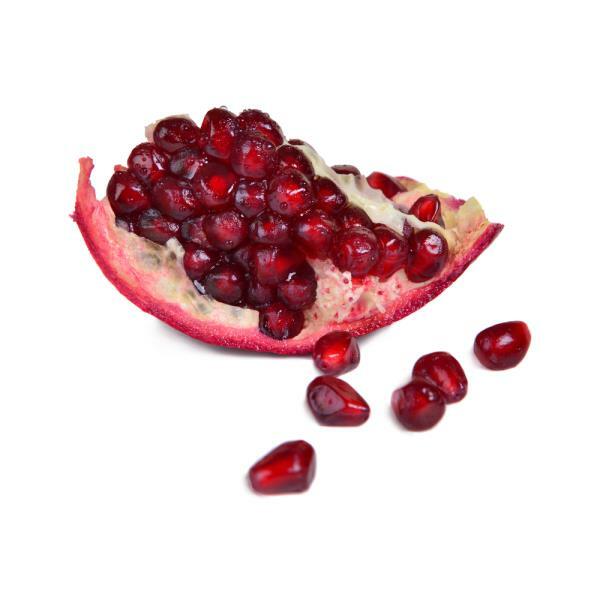 Pomegranate has been used in Ayurvedic medicine for thousands of years. Not just the fruit but the bark of the tree and the fruit rind is used to stem diarrhoea, dysentery, bladder problems, mouth ulcers, and intestinal parasites while the seeds and juice are considered a tonic for the heart (1). Pomegranates are phenol-rich and contain ellagitannins, a powerful antioxidant; other ingredients include pantothenic acid and flavonoids, plus vitamin C unsaturated oils, fiber, and many other micronutrients, especially in the seeds(2). It is known as an immune system booster, and inflammatory agent and research indicates benefits in cancer, diabetes, fighting viruses, coronary heart disease and even brain damage. A number of research studies have also been undertaken with prostate cancer and a few with breast cancer. 1. Two natural phenol compounds, common in colourful fruits, like pomegranate, plums and peaches, have been shown to stop breast cancer cell growth. The two groups of phenols (called chlorogenic and neochlorogenic compounds) were shown to do this in research (Journal of Agriculture and Food Chemistry) by AgriLife food scientists Dr. Byrne and Dr. Luis Cisneros-Zevallos. 2. Several studies (for example in Cancer Prevention Research, Jan 2010) have showed that phytochemicals called ellagitannins could prevent the development of hormone-dependent breast cancer and halt the growth of oestrogen-driven tumours. 3. According to the results of a long-term study presented at the 104th Annual Scientific Meeting of the American Urological Association (AUA), Maryland, pomegranate juice may effectively slow the progression of the prostate cancer, even when regular treatment has failed(3). The two step clinical trial followed 48 men over six years. Each research subject had a rising prostate specific antigen (PSA) level after surgery or radiation therapy greater than 0.2 ng/ml and less than 5 ng/ml. The study participants were given eight ounces of pomegranate juice daily. These patients were then compared to those not taking the juice. Despite all the men having similar PSA scores at the outset, after 56 months, there was a significant difference and progression had slowed down dramatically in the men who regularly drank pomegranate juice. "This study suggests that pomegranate juice may effectively slow the progression of prostate cancer after unsuccessful treatment," said Dr. Christopher Amling, an AUA spokesman. "This finding and other ongoing research might one day reveal that pomegranate juice is an effective prostate cancer preventative agent as well." 4. Researchers at the University of California, Riverside (UCR) have shown that it contains natural compounds that can block prostate metastases. At the American Society for Cell Biology’s 50th Annual Meeting the researchers found that phenylpropanoids, hydrobenzoic acids, flavones and conjugated fatty acids in the fruit had the potential to stop cancer cells developing, to prevent metastases to nearby bone cells and even to kill prostate cancer cells. The pomegranate juice increased cell adhesion and thus decreased cell migration to other tissues. This research and much more has led to the inclusion of pomegranate in a unique polyphenol mix called Pomi-T, researched in a placebo-controlled Clinical Trial amongst 200 men with prostate cancer, by Professor Robert Thomas in the UK. Professor Thomas showed that the PSA scores of recipients of pomegranate, broccoli, EGCG (from green tea) and curcumin, were 30 per cent more able to stay on active surveillance programmes, and at the end of a six-month trial, their PSA levels - a protein which is an indicator of the cancer - were 63 per cent lower than those who took a placebo. You might like to check out the shop Natural Selection to see prices and sizes available of Professor Thomas product POMI-T.
See our complete review on Pomegranates and longevity, diabetes, reducing artery plaque and on cancer HERE.